Since adding the ability to create HTML5 Top Navigation outputs to MadCap Flare, we’ve seen our customers create amazing online help sites with Flare. Just take a look at our Customer Showcase and you’ll see dozens of companies with stunning documentation portals, help centers, knowledge bases, and more. If you’ve ever browsed the Showcase and wondered, “How can I create a modern-looking online Help or support site?”, there’s a solution for you. Along with the release of MadCap Flare 2017 r3, we’ve also created new Top Navigation project templates that provide an easy starting point for users. View the templates in action here. These templates are free to download and use for your MadCap Flare projects. Note: the templates are supported in Flare 2017 r2 and above. The new project templates provide an easy way to create a fully responsive Top Navigation site, without the need for additional CSS or design resources. They can be quickly implemented into a MadCap Flare project, and are designed to be easily branded with your own company logo, colors, company information, and so on. Logos can be changed in every template. Resize your logo to proper dimensions before selecting it in Flare. The dimensions of the placeholder logo are 229 x 55 pixels. Open the HTML5 – Top Navigation Skin, which can be found through the following path: Project Organizer > Skins > HTML5 – Top Navigation Skin. Go to: Header section > Logo > Background > Image. Select the button to browse and open the image that will be used as the logo. Open HomePage, with the following path: Content Explorer > Content folder > Resources folder > MasterPages folder > HomePage.flmsp. Right-click the placeholder logo and select Image Properties. In the Image Properties window, select the browse button to browse and open the image that will be used as the logo. Note: Changing the logo in the home master page is supported in all templates except the Torrey Template. Template colors can be easily modified on all templates to match the look and feel of your own brand or organization.To update the colors in a template, they need to be updated in multiple files. Before starting, determine the hex values for your starting and ending colors. 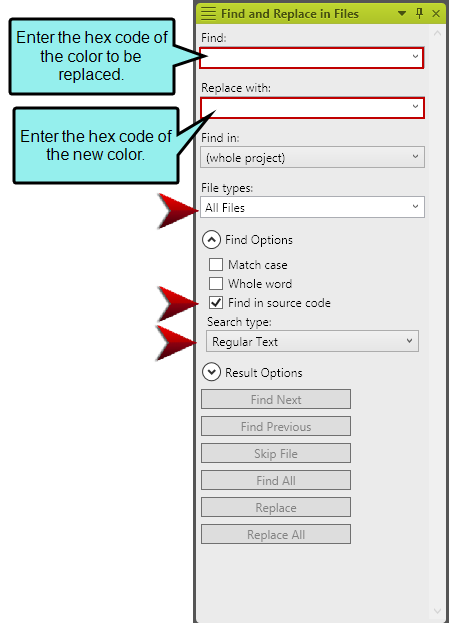 Then, use Find and Replace in Files to replace the current colors. Open Find and Replace in Files, which can be found by going to Home Ribbon > Find and Replace in Files. #004863 is the footer gradient color on the home page. #ECECEC is the background-color on the home page and other topics pages. #5C6783 is the color for second tile header on the home page. #7E869A is the color for third tile header on the home page. #669A69 is the color for fourth tile header on the home page. #7469b9 is the primary color. #7469b9 is the secondary color. In the Replace with field enter the hex code of the new color. Build Target and View changes. Note: A message will appear that will notify you that this could result invalid XML. Ignore this if you are working solely in the template project. If you have imported other files into the template project those files will be affected. The hero image is the banner image that spans across the screen of the home page. There are two templates that use hero images: the Balboa and the Soledad template. Hero images in these templates are changed in StylesForHomePage.css. If you’re in the Simplified view of the Stylesheet Editor, switch to the Advanced view. To switch to the Advanced view, select the button in the local toolbar of the Stylesheet Editor. In the Advanced view, set the style filter to Paragraph Styles. Find and expand the div group. To change the first hero image on the home page, select topic-hero and change the background-image to your own. To change the second hero image on the home page, select info-container and change the background-image to your own. Note: The size of the images included in this template project are 1200 x 800 pixels. Since this template includes white font color overlay on the hero images, a darker image will look best. Want your users to be able to reach out with questions or comments? Contact information and social media URLs can be easily changed in all templates, in the General variable set. In the Variable Set, edit definitions to replace with your own contact information and social media URLs. In order to use this template, files need to be imported into your already existing Flare project. Before starting, make sure you create a backup of your existing Flare project, which can be done by selecting Project Ribbon > Zip Project. Open the existing Flare project. Go to Project Ribbon > Import > Flare Project. Select the button to browse and open the template project. The Accept Imported Documents window will appear. Review the files that will be imported into your Flare project. If there are file names that are the same in your existing project, you’ll want to rename files from within Flare in order to maintain links between files. Build and View the imported HTML5 – Top Navigation target. Note: After importing the template project, imported files will have an icon overlay. This means that a link is maintained with the imported project. If you do not want to keep the link and want to remove the icon overlay, delete the import file. To do this, use the Project Organizer and go to the Imports folder, then delete the Balboa file. Want to see the templates in action? I’ll be hosting a webinar on November 16th, showing how to integrate the new responsive project templates into your Flare projects. In addition, I’ll also provide some customization tips (such as the ones above) that you can apply to make the most of the templates. Have you tried these templates for yourself? Got any questions or tips on how to customize the templates? Leave a comment below! Great job on the new templates and the Webinar last week. I have a question about the Parallux template. I built a project using this template and I am wondering if it is possible to customize the “other topics” master page side menu to use a custom TOC in only certain topics. For example: I have 3 topics housed in 3 separate books (all three books are included in one top level book) in the main menu on the home page. I want to create a custom TOC that includes only these three topics, that will display as the side menu on each one so that readers can toggle back and forth between the three topics. Or is there a different or better way to achieve this result? Thanks I’m glad you enjoyed it! To do this you will need Browse Sequences and a new Master Page. You would first create a Browse Sequence with the 3 topics. Then copy the “OtherTopics” master page. Now, in the new master page right-click the menu proxy and assign it to the browse sequence. Last step! You must assign the Master Page to those topics. Which you can assign quickly via the Topic Properties. An example project can be downloaded here: http://ts.madcapsoftware.com/Downloads/JustinB/BrowseSequence.flprjzip. To see it in action build the Target and search for “FAQ”. Hope this helps! Thanks for the info, I will give this a go. I one more question regarding the side menu on this master page. If I want to increase the line height for the side menu items, what style should I adjust? I have many menu items (topic titles) that end up taking two lines and the default line height is a little tight. To edit the Line Height you will need to make the changes in the Menu Skin Editor. Open up the Skin file > Go to Styles tab > Menu > Block > Line Height. Then change the line height value to increase the spacing.